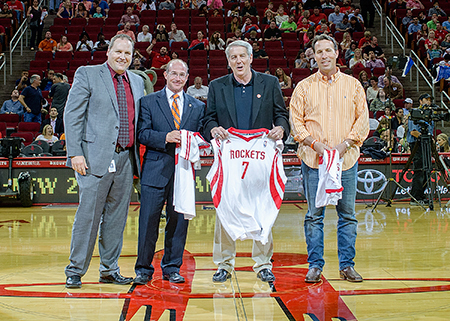 The Sam Houston State University sport management program will host “SHSU Night with the Houston Rockets” at Houston’s Toyota Center on March 27. Students, faculty, staff and alumni are invited to join in on the fun as the Rockets take on the Minnesota Timberwolves at 7 p.m. that Saturday. This is the fifth year for the program’s signature event and the second year with the Rockets. The first three years, the event was held in partnership with the Houston Aeros who relocated to Des Moines, Iowa, after the 2013 season. Students attending the game will receive a pregame meal, sponsored by Student Activities, at the Lake House Restaurant, located at Discovery Green, near Toyota Center. There are a limited number of spaces available, so students should reserve tickets early. In addition, event sponsors and alumni who purchase designated blocks of tickets will be invited to take part in a VIP event from 5:30-7 p.m. in the 94-95 Room at Toyota Center. SHSU President Dana Hoyt, Athletic Director Bobby Williams, Head Men’s Basketball Coach Jason Hooten, and Women’s Basketball Coach Brenda Nichols will be featured SHSU guests at the VIP event, which is being sponsored by the College of Health Sciences and Student Services. The VIP Event will also feature the presentation of the 2015 Industry Impact Award to Janis Schmees Burke, CEO of the Harris County-Houston Sports Authority. Burke has been instrumental in helping Houston obtain major events such as the 2017 Super Bowl, NCAA Men’s Basketball Tournament regionals and finals, and the World Weightlifting Championships, according to Zapalac. Other special guests for this year’s event include Sammy Bearkat and SHSU’s ROTC, who will be presenting the colors for the National Anthem before the game. 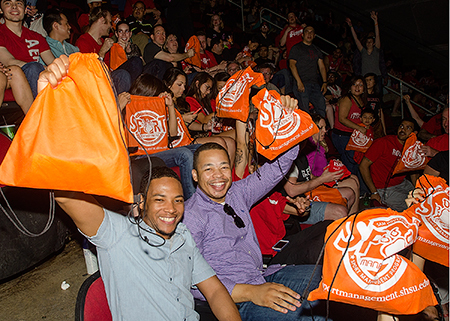 Everyone is encouraged to show off his or her Bearkat pride at the event by wearing SHSU attire. There will be a limited number of giveaways for SHSU attendees. 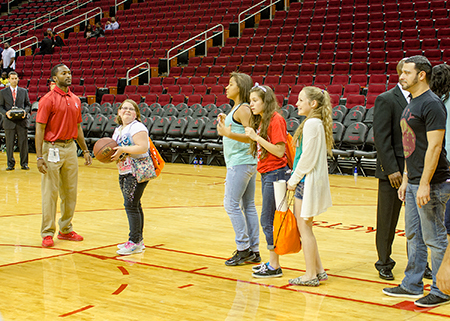 After the final buzzer of the game, all SHSU attendees will have the opportunity to get on the home court of the Rockets and shoot free throws. Discount tickets will be available at three price levels for Bearkats: $25 tickets in the upper end zone, which are almost sold out; and at $33 and $59, with seats still available. Tickets can be purchased online at rockets.com/promocode with one of the following codes: SAM, SHSU, KATS or DUNK. The code will only be active for a limited time; students, faculty, staff and alumni interested should purchase tickets timely. Registration for the student pre-game meal and for the VIP event is available at shsurockets.blogspot.com. More information can also be found at sportmanagement.shsu.edu. Student organizations that want to bring letters or signs to the game must make a group ticket purchase and should contact Derek Billingsley at djb039@shsu.edu, Kaelum Messer at kcm029@shsu.edu, or Dennis Reiner at dmr019@shsu.edu.